CUCINA ANDARE’s new location at the roof deck of Glorietta the Link Car Park building is the new favorite hangout for all our foodies out there. You can find the Glorietta the Link Car Park building beside Makati Shangri-la and in front of the Landmark Department Store. Situated with a grand view of the Makati skyline, CUCINA ANDARE is the newest venue for delicious food finds. CUCINA ANDARE is part of the MERCATO CENTRALE GROUP’S growing number of food markets all over the metro. During the launch, the MERCATO CENTRALE GROUP also brought along some friends from RADIO REPUBLIC, (www.radiorepublic.ph), an online music channel/magazine that champions Original Philippine Music (OPM), who showcased groundbreaking musical talents. The entertainment line-up consisted of Inky de Dios, The Slinks, Steady Machine and Kjwan. Not to forget the creative group of VINYL ON VINYL (http://vinylonvinyl.blogspot.com), who merges art, toys and music, featured in a modern gallery which highlights pop culture artists from contemporary art, underground and street art.AnjoBolarda painted an eight foot tall, twelve foot wide live art to kick off an amazing launch. Truly, CUCINA ANDARE has become an arts & music & food hub in the secret roof top escape of the Glorietta Link Carp Park Building. 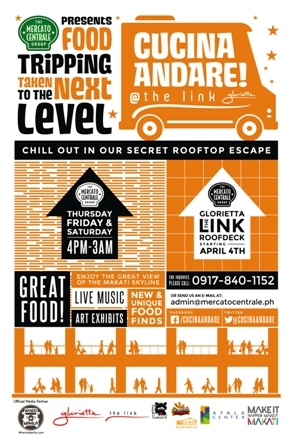 CUCINA ANDARE boasts great food, music & art in its new home atop the Link Glorietta structure. The food, music & art market is open every Thursday, Friday and Saturday from 4pm to 3am. The MercatoCentrale markets have been the birthplace of many fast-growing food companies including Manang’s Chicken, Mochiko, Merry Moo, Chuck’s Grubberie Mio Gelati, Spring by Ha-Yuan, Kristina’s Inutak, Zen Taclings, Eat My Garlic Fries and many more! Join the growing MercatoCentrale family!